Between 6 and 10 million people in the U.S. suffer from borderline personality disorder. This book teaches adult children how to overcome the devastating effects of growing up with a parent who suffers from BPD. Although relatively common, borderline personality disorder (BPD) is often overlooked or misdiagnosed by therapists and clinicians and denied by those who suffer from it. If you were raised by a BPD parent, your childhood was a volatile and painful time. 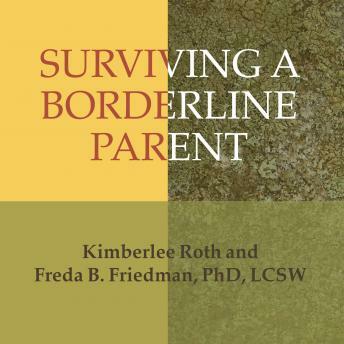 This book, the first written specifically for children of borderline parents, offers step-by-step guidance to understanding and overcoming the lasting effects of being raised by a person suffering from this disorder. Discover specific coping strategies for dealing with issues common to children of borderline parents: low self-esteem, lack of trust, guilt, and hypersensitivity, and make the major decision whether to confront your parent about his or her condition. Can highly recommend this book for more clarity in dealing with trauma in childhood.